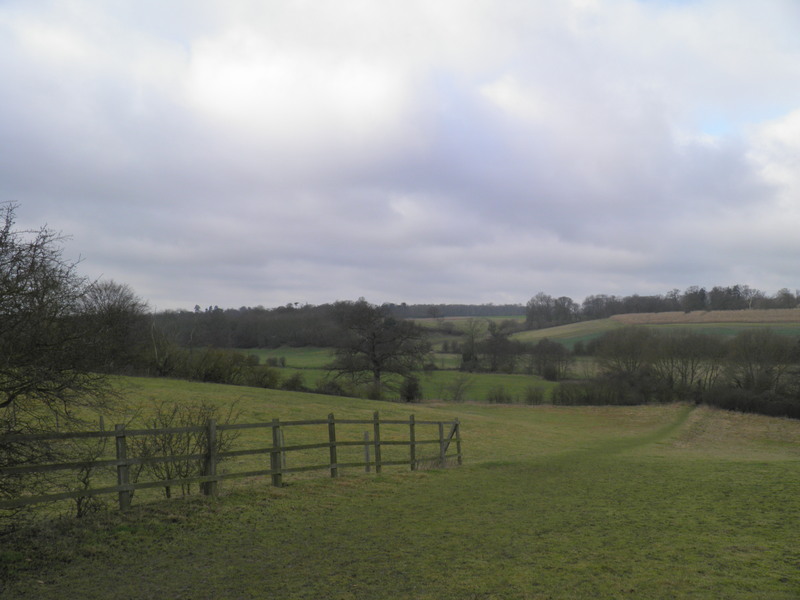 This walk cuts across the wide open, wood-spotted Hertfordshire fields, before descending into the sylvan valley of the Ash, following old railway lines and navigations to the lakes and reedbeds of the Lee valley. 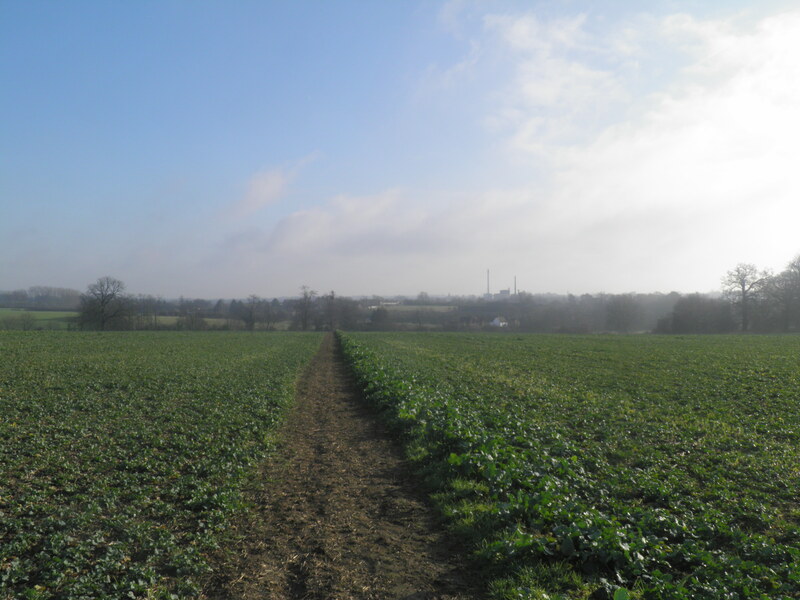 Underfoot: The first half of the route consists of field paths which will require good footwear at all times of year – you may feel like you are leaving some fields with half of them still on your boots! After Widford, paths tend to be firmer underfoot. Terrain: Mainly flat, with very gentle climbs and descents. Maps: 1:50,000 Landranger 167 Chelmsford and 166 Luton & Hertford; 1:25,000 Explorer 194 Hertford & Bishop’s Stortford. Getting there: Four trains an hour (3 on Sundays) link London Liverpool Street with Harlow Town (30 mins), with all trains calling at Tottenham Hale (20 mins) for Victoria Line connections. In addition, there are 2 trains per hour (one per hour on Sundays) from Stratford (42 mins) for Jubilee, Central line and DLR connections, which also call at Tottenham Hale. 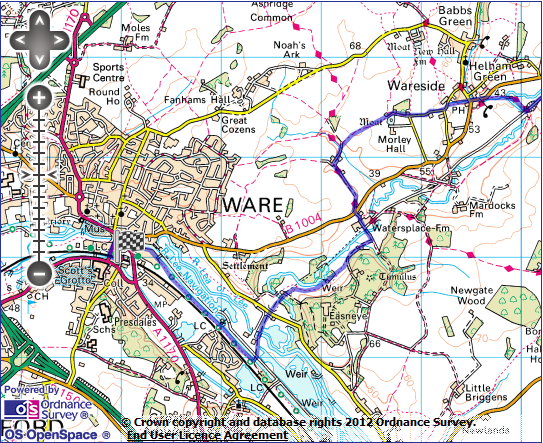 Useful websites: Part of the route follows the Hertfordshire Way, and passes through the Amwell Nature Reserve. Scott’s Grotto at Ware is occasionally open to the public. Getting home: Two trains per hour run from Ware to London Liverpool Street (45 mins). Monday-Saturday, all trains call at Tottenham Hale (37 mins) for Victoria Line connections and trains to Stratford. On Sunday, all trains instead call at Seven Sisters (34 mins) for Victoria line connections. Fares: Harlow Town and Ware are on separate branches, so it is necessary to buy two tickets to cover these journeys. The cheapest combination is a super off-peak day return to Ware for £8.00 (£4.00 child, £6.00 railcard) and an Anytime single from Broxbourne – where the lines split – to Harlow Town for £3.80 (£1.90 child. £2.50 railcard). Note that using this combination means you have to take a train to Harlow which calls at Broxbourne – two London trains an hour do so (as do Stratford trains), but those travelling towards Stansted Airport do not. village of Harlow was gradually transformed into a New Town of 81,000 people following World War 2, as part of plans to ease overcrowding in London. The town included Britain’s first pedestrianised precinct and its first residential tower block. On this route, you will see few such delights. Whilst the first five minutes are uninspiring, you are quickly out of town onto the Stort Navigation. 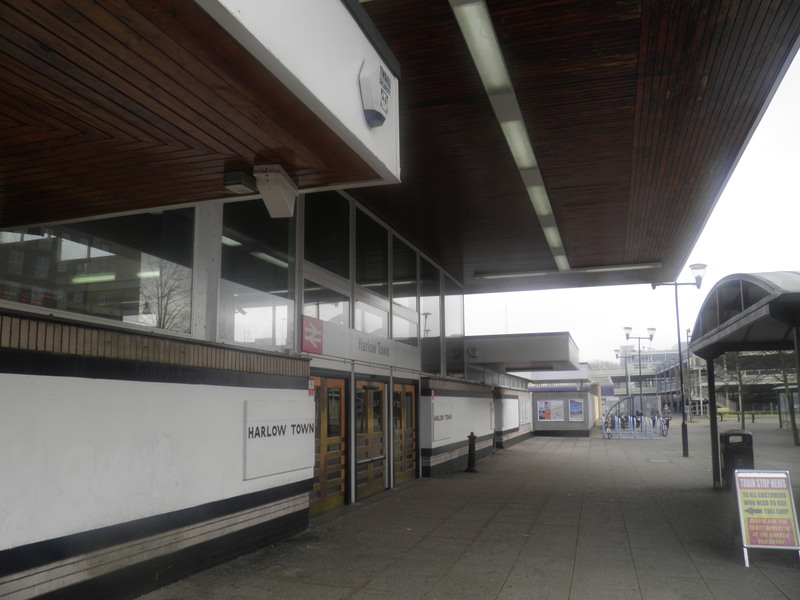 Trains from London mainly arrive at platforms 3 or 4 at Harlow Town. Exit the large station via the covered footbridge and the ticket hall. In the station forecourt turn right, following a road curving between office blocks to a large roundabout. Take the first exit on the right, following a busy road (the A414) over the railway bridge. Shortly after the railway, turn right on Burnt Mill Lane, descending past a large outdoor learning centre to the waterways. Follow the road left over the mill leat, and almost immediately afterwards turn right through a white foot gate to join the Stort Navigation towpath at Burnt Mill Lock. 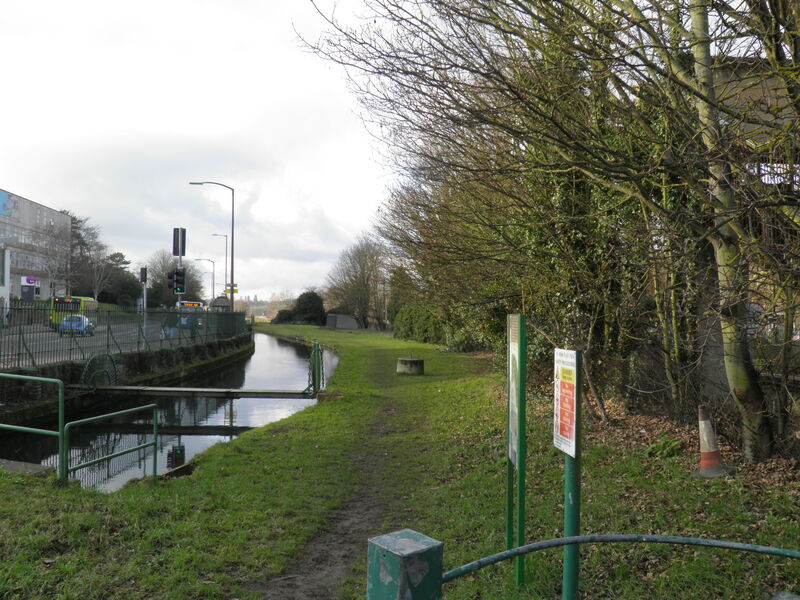 The 22 mile long section of the River Stort from Bishop’s Stortford down to the confluence with the Lee was canalised in 1769, including 15 locks along its length. Its primary purpose was to carry the products of Bishop Stortford’s mills (including malt and barley) to London and the Thames. Several attempts were made to build a navigation north of Bishop’s Stortford to provide a London to Cambridge waterway, but these came to nothing. 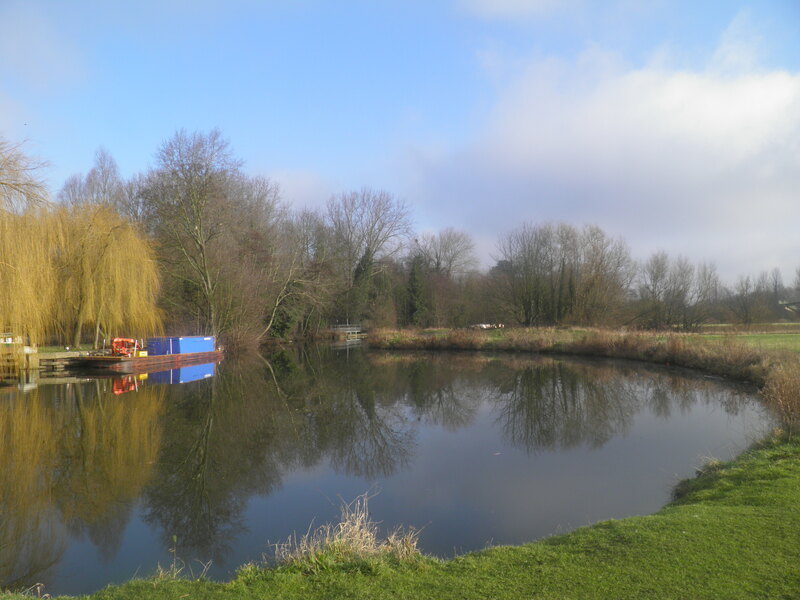 The last commercial traffic was carried in 1972, but the Stort has remained a popular waterway for leisure cruising. 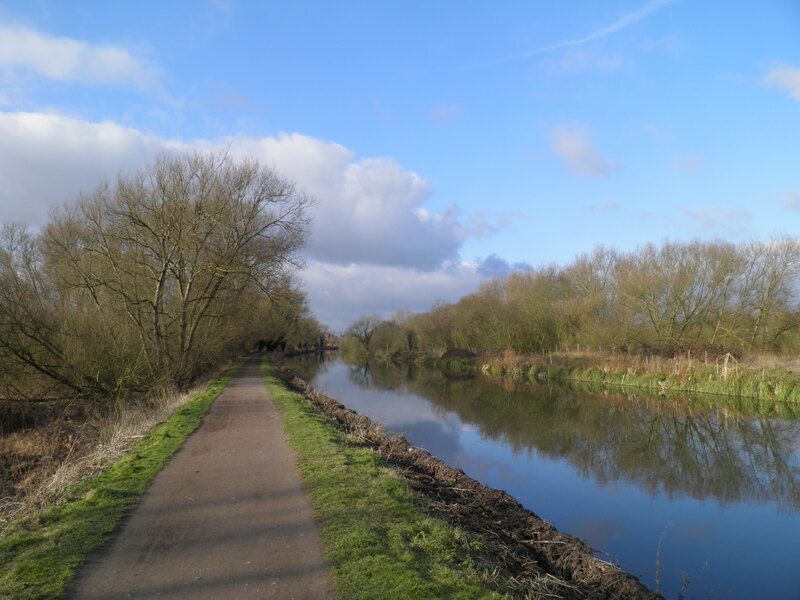 Beyond the lock, the towpath leads past the back of the station and out into the open water meadows, passing a large marina on the opposite bank. 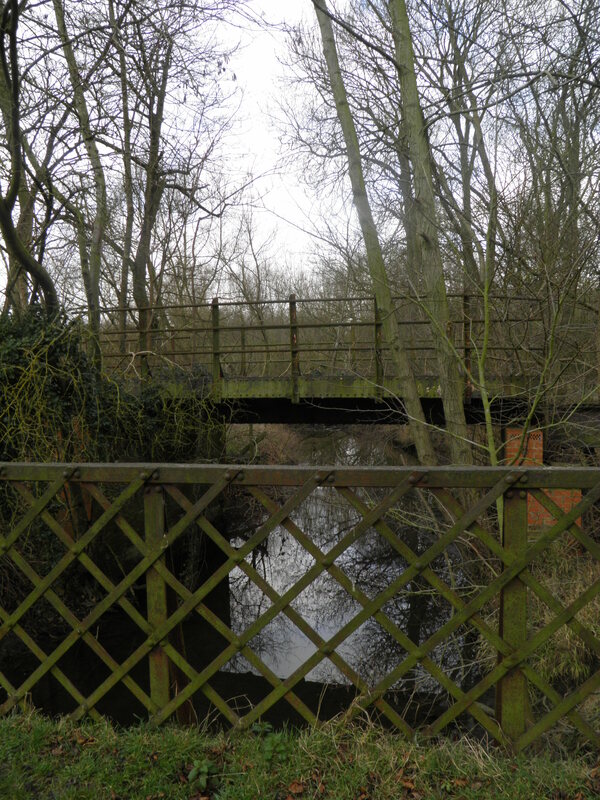 After a little under 1km, cross the first bridge over the river (signed to ‘Harlow Mill’). On the other side, pass through the green kissing gate straight ahead and follow a faint path across the boggy fields towards the houses of Gilston. At a small car park turn right, past attractive cottages, to join the busy road through the village. By the village hall, cross to join the pavement on the left hand side, and take the minor road left by the Plume of Feathers pub. Pass the last few houses of Gilston before taking a footpath on the left by a white metal barrier. This leads into the former parkland of Gilston Park, now planted with brasicas, but still studded with large trees. The clear path leads gently uphill ahead. 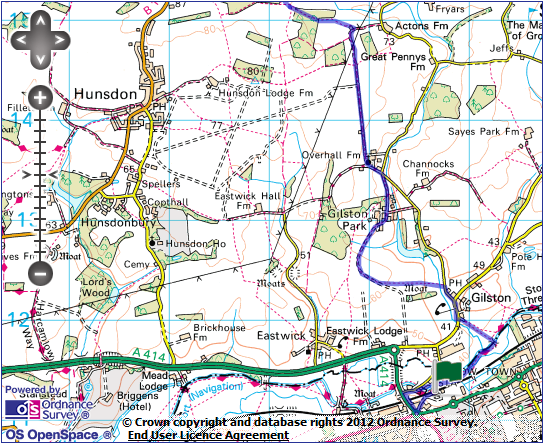 The path eventually joins a grassy track (at a surprisingly good viewpoint back towards Harlow) and follows it to the right. The track drops to cross a small brook, where you keep straight ahead towards the enormous Victorian edifice of Gilston Park. The huge house, composed of an amalgam of Tudor and Gothic styles, was completed in 1852, built for the local MP. The house was extended still further in 1903, and after ceasing to be a private home served a while as the headquarters of a pharmaceutical firm. At the turn of this century, Gilston Park was converted into apartments, winning several prizes for the sensitivity of the restoration. A Tudor manor house, ‘New Place’ stood near this site before being demolished. Follow the waymarks onto a gravel drive passing to the right of the house. The drive then curves left to become the tarmac access road for an estate of modern houses built on the site of old the former stable yard. Keep straight ahead to reach the cross roads at Golden Hill. Take the dead end road left towards the church. The delightful church of St Mary the Virgin shows very clearly that it is a hotchpotch of designs and materials. 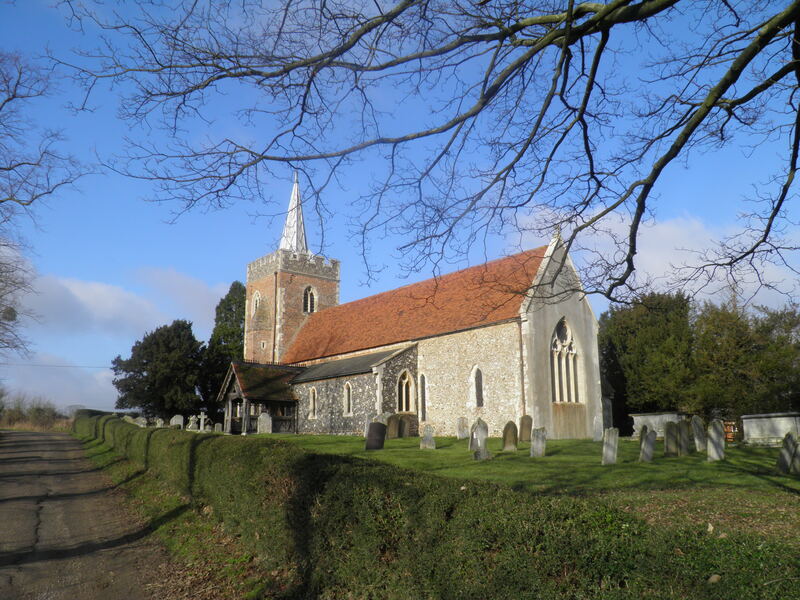 The first small church was built on this site in the 12th century, saw extensions in the 14th and 16th centuries. The spire and porch were added in the 19th century. The pulpit contains wood panels rescued from the demolished New Place manor. Past the church, turn right (signed as a byway to Acton’s Farm) on a broad hedge-lined track cutting straight across the plateau. Eventually, the track passes under pylon line and curves to pass little thatched cottage at High Trees. Immediately after the cottage, turn left on a waymarked footpath which swings around the back of the house to join a track cutting across the field towards Lawns Wood. On reaching the wood, follow the waymarks leading off the track to briefly follow the left hand edge of the trees, before cutting through the wood. Emerging from the trees at a post carrying a mass of waymarks, leave the tracks and take clear path cutting diagonally across the field ahead towards the next wood (Marshland Wood). At another signed path junction at the corner of wood, take the footpath straight ahead over a tiny footbridge and across the next field. At the hedgerow ahead, take the track to the left. Ignore the footpath branching to the right and continue on the track (now a permissive path) towards the houses of Widford amongst the trees ahead. At a track junction, keep left. telephone box (the Green Man pub is just ahead). At the end of a row of bungalows, keep right to reach a small road on a housing estate. Turn left then almost immediately continue right on another tarmac footpath path (signed to ‘Little Blakesware’). The path quickly leaves the houses behind and drops into the Ash valley. 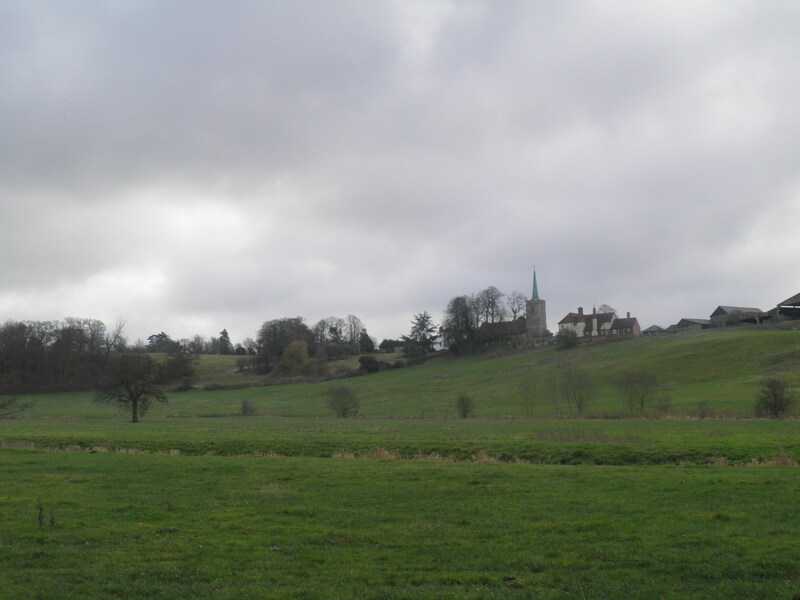 To your left, views open up of Widford church perched on the valley side. At the path junction in the valley bottom, keep straight ahead on the footpath beside the River Ash, soon crossing it on a footbridge. Where the path leaves the river, keep ahead over a stile (with a byway waymark! 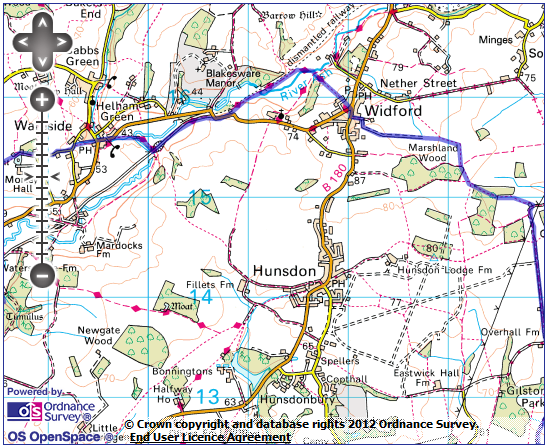 ), keeping just to the left of the course of a disused railway line. The railway line up the Ash valley, which must have been a delightful run, was a 14 mile long branch line running from the Hertford East line to the small country town of Buntingford. 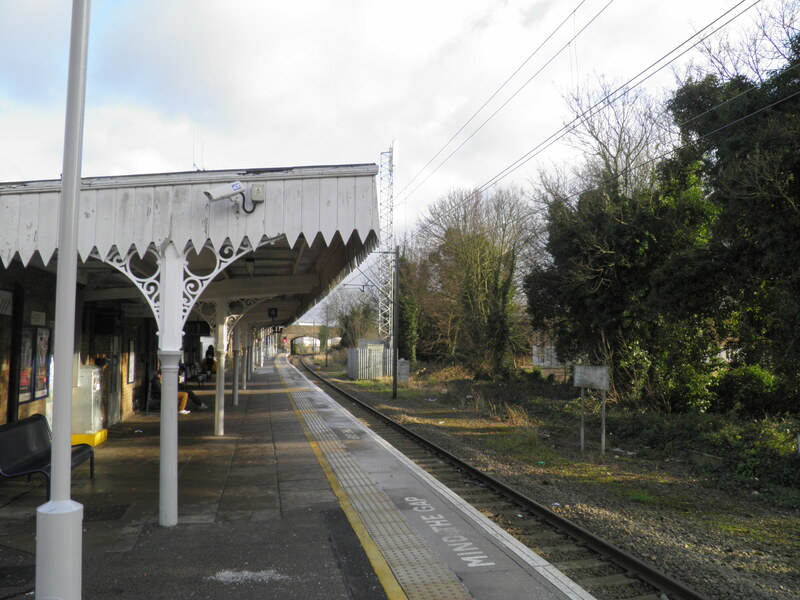 The line opened in 1863 and was surprisingly successful for such a rural route, with through services to London provided. From the start, the potential to exploit the rural delights of the area were recognised, with special tickets to encourage walkers to use the line. The line went into decline when car ownership allowed commuters to access much faster London services on the Kings Cross line, leading to the route succumbing to the Beeching Axe in 1964. Recross the Ash on a more substantial bridge and keep ahead through a gateway, continuing beside the railway trackbed to reach the B1004. Turn right along the narrow pavement for 200m (the builders’ yard below is on the site of Widford station) until the road turns sharp R over old rail bridge. Cross with care and take the footpath opposite (signed to ‘Mardocks’). The path continues beside the former rail line before eventually joining the trackbed alongside the Ash. The river curves away, after which the line runs through a cutting. At the end of the cutting, just before the railway re-crosses the river, turn right beside the Ash on a signed footpath, before long veering left to cross it on a well-hidden footbridge. 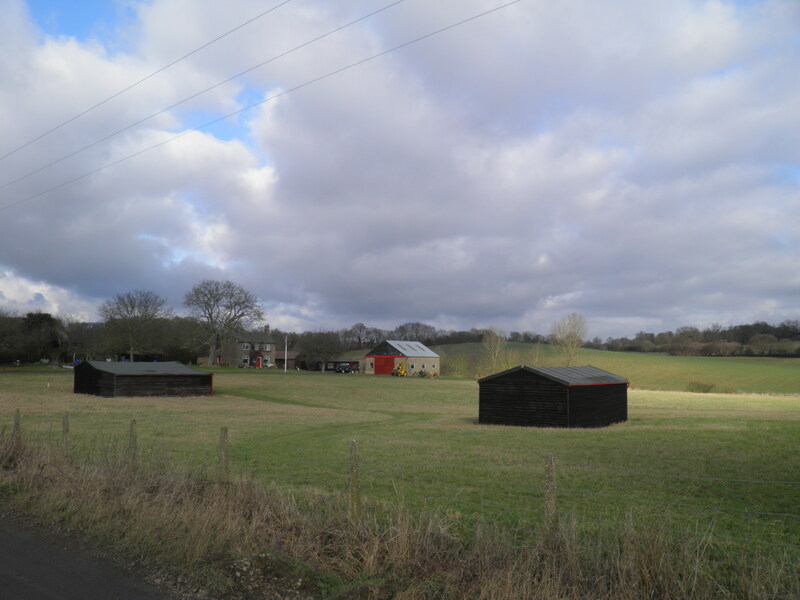 From here, a clear path then follows small tributary -called Nimmey Bourne – towards the village of Wareside. the diminutive Chequers Inn. 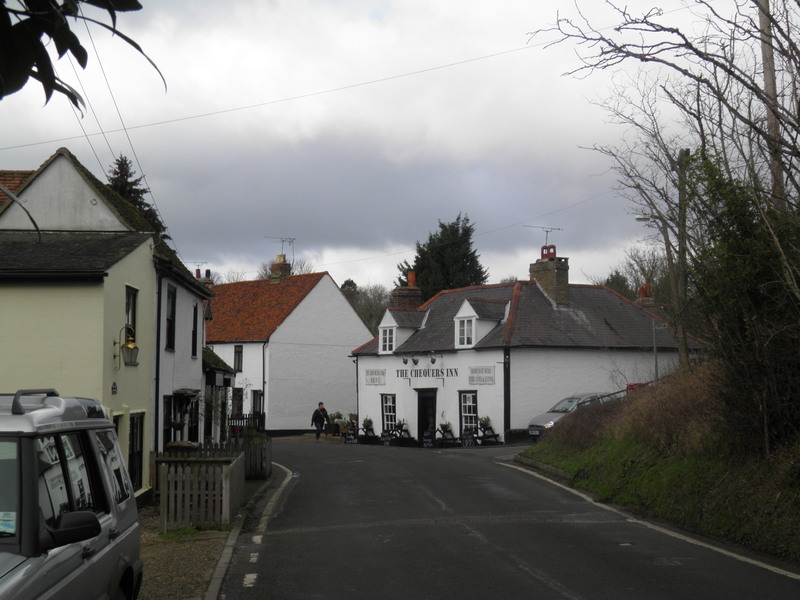 Just before Wareside’s second pub, the White Horse, turn right on the road signed to Babbs Green, then immediately cut left on a footpath beside Bourne Cottage. The path climbs gently beside a normally dry stream to reach a minor road. Turn left and at the road junction by a primary school, go right. Follow this little road up into the open fields. Where the road turns sharp L by Morley Pond Cottages, keep straight ahead on the track (signed to ‘Watersplace’). The track leads yellow-painted Morley Hall to the left, with glimpses of its moat and an impressive treehouse through the trees. walled gardens to descend an attractive, slightly sunken path to a valley by Newhole Farm. 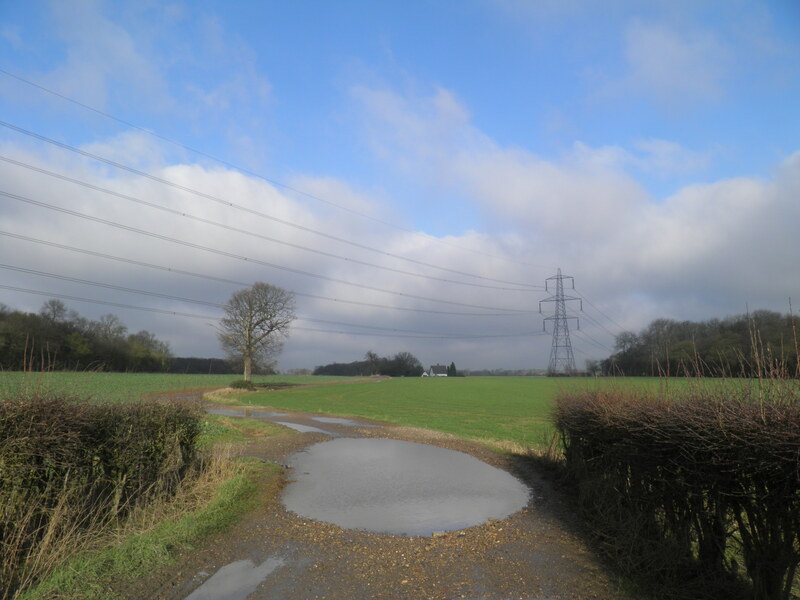 The path runs between farm buildings, then swings left to follow the farm access track (follow the byway waymarks). The track soon returns you to the B1004. Cross and take the drive opposite towards Watersplace Farm. 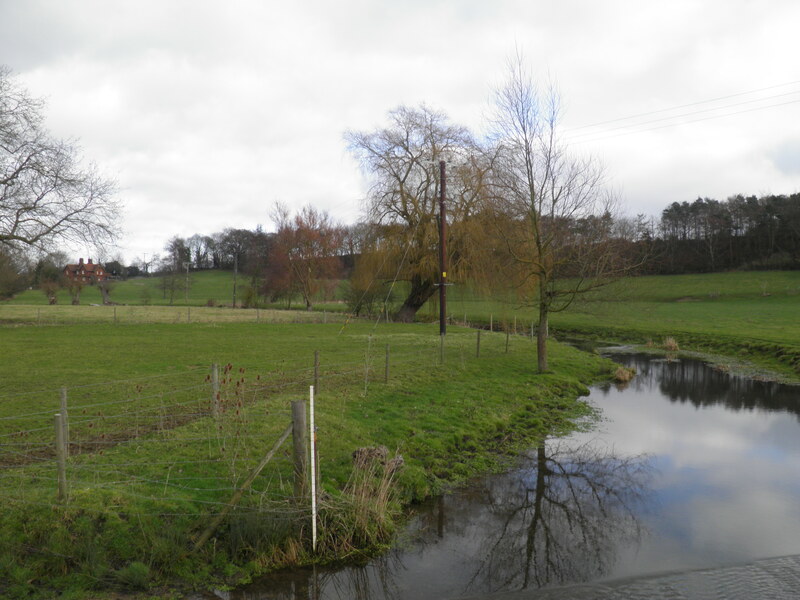 Pass through the complex of farm buildings and cross the willow-dotted Ash by the footbridge beside the ford. At a track junction just after ford, turn right to keep to the valley floor, passing a yellow weatherboarded cottage. Where the track swings uphill, the right of way continues straight ahead into the valley fields. Glancing back, you will catch a glimpse of the grand brick Dairy Farm, with gateway, dovecote and small chapel. Thick woods on the hillside to your left obscure Easneye College. Easneye Manor, which these are the grounds of, was constructed in the 19th century for the Buxtons, a wealthy brewing family. Since 1964, it has been the home of the All Nations Christian College, a large missiological training establishment. The path is soon beside the meandering Ash again and a little afterwards, you reach the old railway once more. Use the stile to access the trackbed heading left, which before long leads to one final crossing of the Ash on a footbridge, with the brick abutments of the rail bridge beside it. Across the bridge, rejoin the railway trackbed (following the Hertfordshire Way waymark, not the yellow footpath arrow). 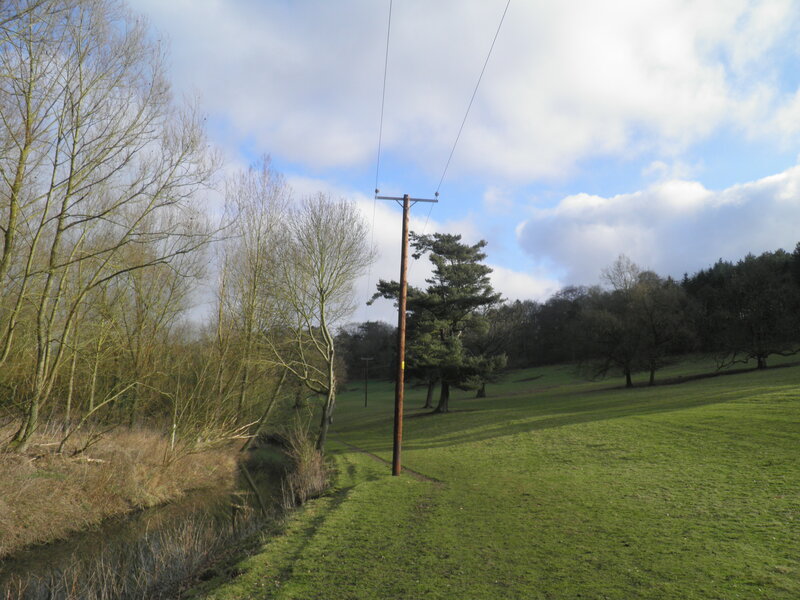 The line takes you under Hollycross Road and into the Amwell Nature Reserve, part of the Lee Valley Park. To your left is Hollycross Lake, with access to its dragonfly trail available between May and September. gravel digging which continued here until 1990. The lakes are now important habitats for wildfowl, including wintering bitterns. 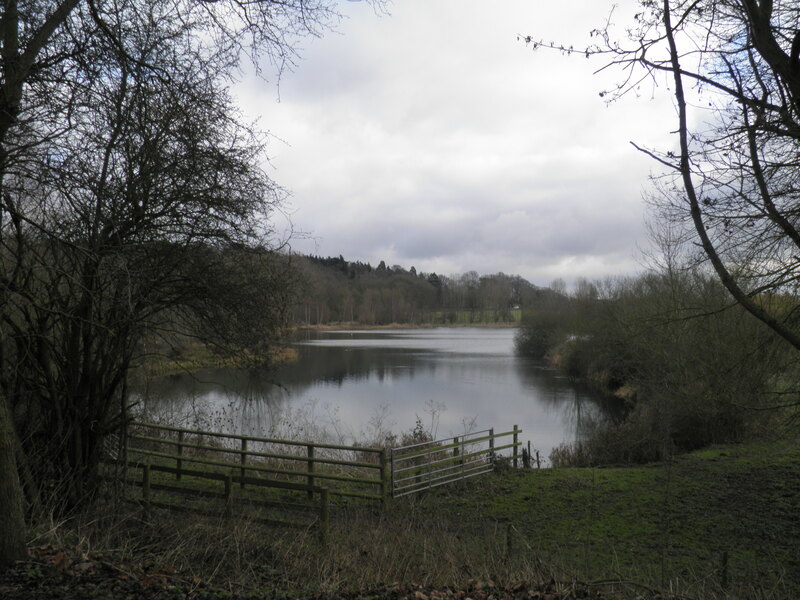 Hollycross Lake is supposedly the best place in the county to watch dragonflies, with 19 different varieties recorded. Keep ahead on the former rail line, crossing the substantial undulating bridge over a back channel of the Lee. From here, a track then leads you to another substantial footbridge over the Lee Navigation. Cross this, descend steps to the towpath and turn left. Thames at Bow right up to Hertford, around 4 miles upstream of here. Efforts to improve the navigability of the Lee began as early as the 15th century, with improvements such as locks and cut-offs continuing to be added well into the 19th century. As late as the 1950s, horse-drawn commercial barges were operating right through to Hertford, but since the 1980s there has been little if any commercial traffic. a level crossing. You can cross the railway to see the New River and Scott’s Grotto. achieved by gravity. To reach Scott’s Grotto (open Saturday afternoons April-September), turn right after the level crossing and take the first left, Scott’s Road. The interconnected chambers of the grotto extend 67ft into the chalk hillside and are lined with shells, flints and coloured glass. 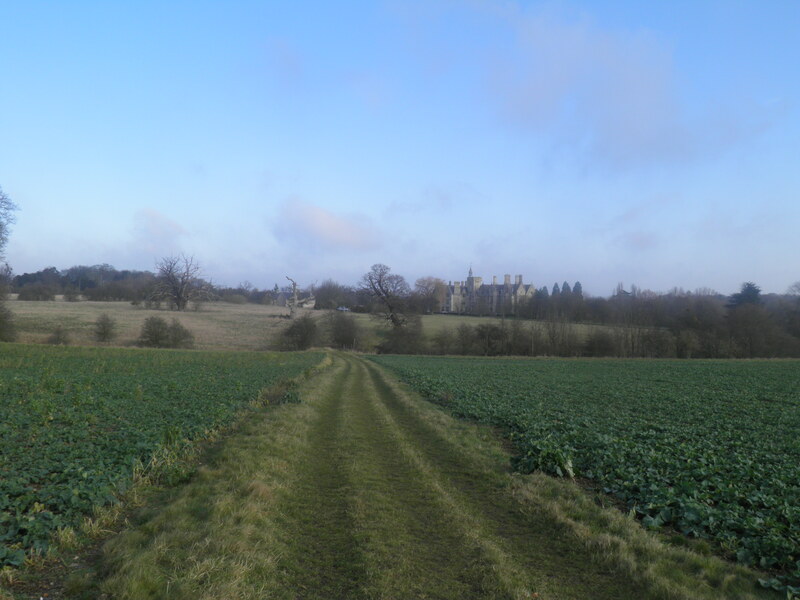 Constructed in the 18th century by poet John Scott, it is speculated that its intention was to draw London society out into far distant Hertfordshire to visit him! Otherwise, simply turn left before the level crossing to reach Ware’s attractive single platform station.